It is official. I am in love with this city. Not in love with the congestion of tourists in the downtown core, or how cutthroat it is to get an apartment. But I am in love with the all of Southern Vancouver Island. The lush forest, the history, the magnolia blossoms the size of a child’s head. It is beautiful here. When we went to Ogden Point Breakwater on the weekend for a walk by the ocean, I convinced Colin to extend our trek to the streets surrounding the area. Because the houses y’all. I’m not even Southern and these houses have me throwing in a y’all. Victoria is one of the oldest cities in Western Canada, and the historical homes are a bunch of show offs. If this post leaves you wanting more, don’t worry. There will be more. More bright colours and wide porches and me unabashedly standing in the middle of the street to get a good shot. No shame. And the siding colour of the year goes to…this home! This muted teal is amazing! I love the unexpected contrast of the rust red door. I wouldn’t have paired those two up but this is adorable. And more cedar. Because when you live in a place that has cedar trees so big you could drive through them, you use it on your house! Now imagine with me what that cedar around the door will look like when it ages and silvers out. The grey with the teal is going to be to. die. for. I love how bright and colourful this home is! Not to mention the double bay windows and all of the scalloped details. And the kitties. Because if this house wasn’t adorable all on its own, just add kitties. Double Turrets!!! (Say that in the same voice as Double Rainbow!!!) In my mind that upper balcony is connected to one gorgeous master bedroom. A little Louisiana right here in Victoria. Usually a pink house wouldn’t get me throwing my Mardi Gras beads away. 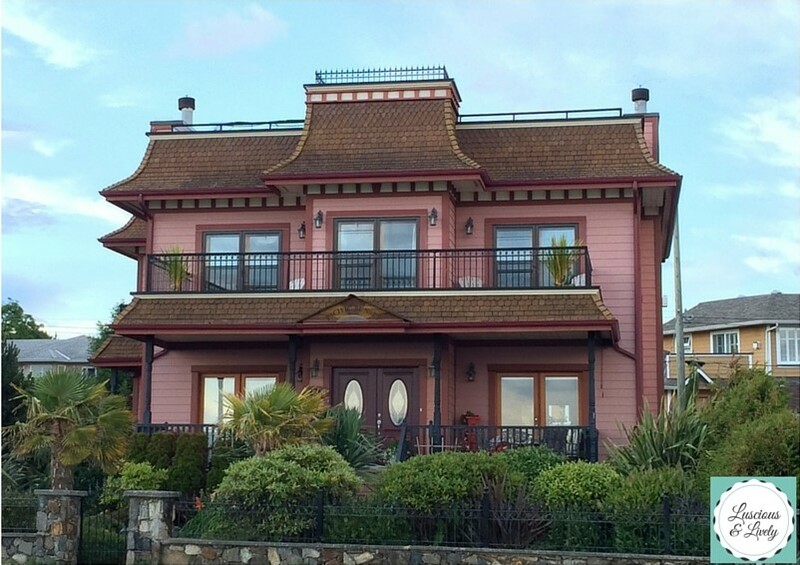 But this house has so much character, I actually think the pink suits it. Add to that the fact that this beauty looks right across the street to the ocean. The triple balconies are a must-have with that kind of view! You know I always save my favourite for the end, right? It’s like cherry pie after BBQ ribs. The rest was good, but this is better. The brick steps. You know I would be bringing that brick into my front entry! The sidelights and transom that match the front door. The details on those columns. THE DETAILS ON THOSE COLUMNS. All the wood trim details, frankly. The way the railings are painted to pull in the colour of the brick. Yum. Colin loves the palm tree. So there’s that! For me, this house ticks every box. It just may be my favourite in the history of ever. Which one do you love? 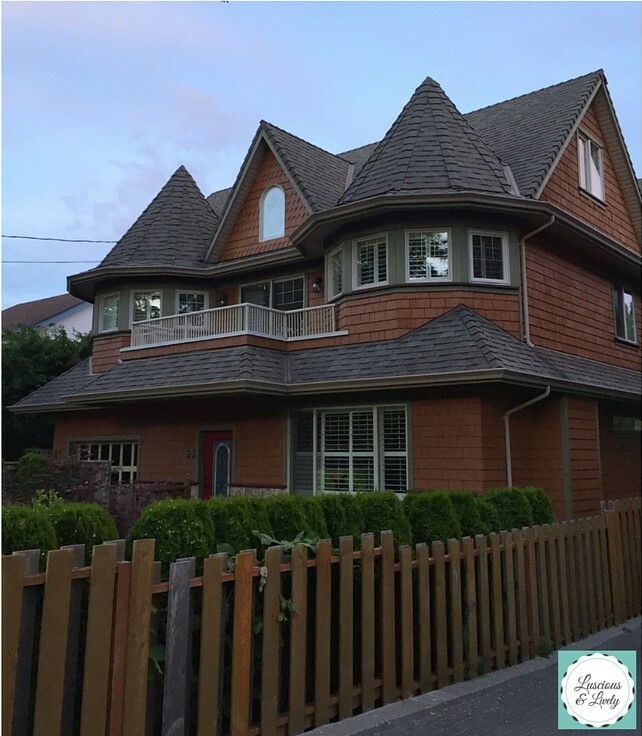 Do have a favourite neighbourhood in Victoria with amazing old homes? Next Post Introducing Tones for Tots! My favourite is the pink one with the balconies because I would be out there All. The. Time! 🙂 But if I inherited any of them, hey, I would be very grateful indeed! Looking forward to more pictures of the lovely homes of Victoria! I will have to check that out! We have been to Sidney but haven’t gone house hunting there!